Your ability to write is always Present. A blog devoted to mindful writing and overcoming writing blocks. In Zen Mind, Beginner’s Mind, Shunryu Suzuki uses two conceptual metaphors to describe the mental formations that arise across the surface of emptiness--mind weeds and mind waves. Mind waves are sensations that momentarily disturb the calmness of the mind, but these sensations are not distinct from the mind. 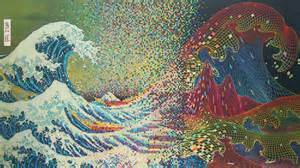 Instead, the waves are mind-generated: “Even though waves arise, the essence of your mind is pure; it is just like clear water with a few waves. Actually water always has waves. Waves are the practice of the water. To speak of waves apart from water or water apart from waves is a delusion." Mind waves connect to the Buddhist concept of emptiness in that the arrival of a mind wave in a meditator’s mind indicates that she may be treating the external world as something with independent rather than dependent origination, as something separate from herself to which she is reacting—and therefore as a discrete, static, permanent entity. Mind waves therefore provide opportunity to reengage with formlessness and overcome binaries. As Suzuki explains, “If your mind is related to something outside itself, that mind is a small mind, a limited mind. If your mind is not related to anything else, then there is no dualistic understanding in the activity of your mind." While mind waves are like disturbances in a calm mind during meditation, mind weeds are difficulties that arise in a person’s meditation practice. Mind weeds are like cognitive dandelions: they invariably happen, but the important point is that mind weeds when pulled out and examined can be used to fertilize mindfulness practice. Suzuki advises, “We pull the weeds and bury them near the plant to give it nourishment… So you should not be bothered by your mind. You should rather be grateful for the weeds, because eventually they will enrich your practice." I need to emphasize the importance of an accepting stance toward both mind waves and mind weeds: in a mindfulness practice for writing, they should be treated as equal to possible content for a piece of writing, nothing more, nothing less. Like dandelions, mind weeds and waves are ubiquitous and hardy—so encounters with them are inevitable. Actual dandelions could be said to be pretty—dabs of highlighter yellow across an otherwise monotone lawn—and categorizing them as nuisances is a matter of perspective. This sort of value judgement—applied to cognitive rather than floral weeds—needs to be monitored since it could well contain product overemphasis for writers. By studying mind waves and weeds with a detached mind, the meditation practitioner can gain insight into habits, obsessions, delusions, and so forth. It’s these very mind weeds and waves that put a mindfulness practitioner at the crossroads: depending on how weeds and waves are handled, suffering or release from suffering ensues. A cycle can ensue in which mind waves lead to more mind weeds and vice versa, and soo for instance a writer may grow a mind wave that is an emotional reaction to a preconception. For writers, mind weeds are the assumptions and judgements that arise via intrapersonal rhetoric during writing practice about the emerging text as well as about the rhetorical situation. Mind waves, on the other hand, are affective responses to both of those matters. Mind weeds are lapses in critical thinking; mind waves are emotional and physical responses to something in the writing situation. Essentially, mind weeds and waves function as rhetorical constraints, in Lloyd Bitzer’s original sense, in their effect and in their source—with a slight difference. I would like to highlight how mind waves and weeds are mind-made and a result of intrapersonal dialog. Whereas rhetorical constraints largely concern events and matters external to the writer (in Bitzer's theory) and to which the writer must respond, mind waves and weeds do not distinguish between self and other, interior and exterior, since it’s all undifferentiated emptiness. For instance, Bitzer mentions constraints “given by situation” such as “beliefs, attitudes, documents, facts, traditions, images, interests, motives and the like” which originate externally to the writer and which his discourse “harnesses." Bitzer adds a second type of rhetorical constraint, one that originates in the writer who, when he “enters the situation, his discourse not only harnesses constraints given by situation but provides additional important constraints—for example his personal character, his logical proofs, and his style." These writer-provided constraints, I would qualify, are not static qualities (personal character) imported into the writing situation but are also manufactured by the writer’s ongoing intrapersonal dialog or monkey mind. Mind waves and mind weeds are generated by intrapersonal dialog. Both are mind-made. Just as a meditator gains insights into his or her tendencies, obsessions, compulsions, etc. from seated meditation, the same is the case with writing: we might be surprised by the concoction of rhetorical factors inside us. For example, even a seasoned and published writer could be taken back by how he is framing a current book project, noting that every third thought discourages or presupposes an unwelcome outcome. A student may believe she is generally unhappy about needing to revise an essay, but upon closer inspection finds that the content of her intrapersonal conversations reveals a more subtle mix of curiosity and trepidation. © 2012 Alexandria Peary. Travel theme. Theme images by Naseko. Powered by Blogger.